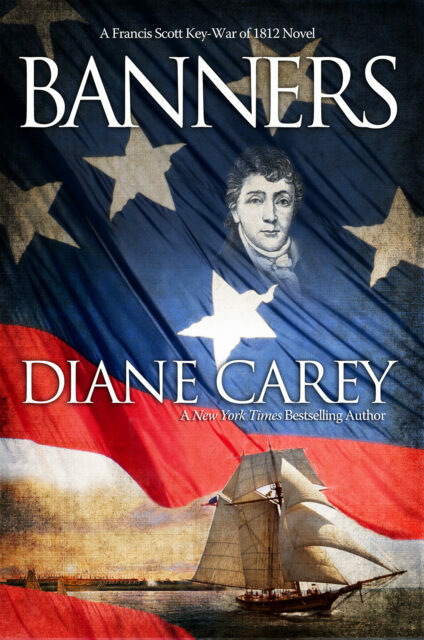 Over the past few days, I read Diane Carey’s Banners, a novel about the War of 1812, published last year by Koehlerbooks, presumably to commemorate the 200th-anniversary of the attack on Fort McHenry and the writing of “The Star-Spangled Banner.” Last night I finished the book. Carey was a prolific Star Trek novelist, publishing two or three novels a year through the 90s. Her Star Trek fiction had a distinctly nautical flavor to it. “Horatio Hornblower in Space,” basically. In the late 90s, one of her Star Trek: The Next Generation novels, Ancient Blood, featured a Revolutionary War-era Royal Navy holodeck program as part of the plot, and it was so well executed that I wanted to read a full Hornblower-esque novel from her. Banners is not quite that novel as Carey takes a broader view on the War of 1812 than just men challenging the sea in wooden ships. I would liken Banners to one of Harry Turtledove’s alternate histories, such as a book in the Great War series, with a sprawling cast of characters, on both the American and British sides, dealing, in various capacities and as best they can, with the war. Banners is micro-level historical fiction, dealing with the doers and the people on the front lines rather than the people back in Washington or London. Like a Turtledove book, there are several storylines in motion. There’s Tom Boyle, the American smuggler/privateer, who feels feels most free when he’s pushing his ship and his men to the absolute limit as he raids British shipping on the high seas. There’s James Gordon, the privileged Royal Navy leftenant who wants to hunt down Boyle and bring him in. There’s Francis Scott Key, a lawyer and pacifist opposed to the war, who feels it’s still his patriotic duty to contribute something to the war effort. There’s Mary Pickersgill, a flag maker who has been commissioned by the commander of the fort commanding the approach to Baltimore’s harbor to make the largest flag anyone has ever seen. These storylines develop and intersect in various ways as the novel progresses toward its twin resolutions. I’d rate Banners good, but not great. Carey’s writing was fine, though I occasionally wanted to take a red pen to her prose. She evoked a definite sense of place; an especially nice touch was her use of smell. Scenes at sea, especially the ship-to-ship action, were taut and well done. The characterizations were nicely drawn, and there were several scenes that were exactly what I expected from a Diane Carey novel, scenes with people discussing leadership, the nature of command, and what good is government for. The novel moved at a good pace. Pages turned quickly. So why did I say “good, but not great”? Frankly, I wanted more from the final eighty pages. Two major events take place off-stage, and they’re narrated one character to another after the fact. I would have liked to see Carey write a land battle (or two) with the Bladensburg Races or the Battle of North Point. With all of the Hornblower happening in the book, what it needed was a chapter or two of Sharpe. Also, the book’s antagonist, Gordon, disappears in the middle of the book; I’d have liked to see another chapter or two with him, especially one that shows his growth, where he figures out how to be a leader. The conversation Gordon had with Tarkio needed to come earlier, and under different circumstances. Finally, despite Francis Scott Key’s prominence on the cover, he’s something of a secondary character in the book and, to be honest, a bit of dullard. I realize why that is, he’s a counterpoint to Boyle. There are men who shape history because they’re men of action and make history happen like Boyle, and there are men who make history because they happen to be in the right place at the right time like Key. Boyle, like Key, is an historical character; except for two paragraphs in Theodore Roosvelt’s The Naval War of 1812 which I read and then forgot, I’d never heard of the man. For someone who has read most of her Star Trek fiction, there were a few moments that felt like Easter Eggs. The United States frigate Enterprise makes a cameo appearance, and some characters discuss the historical incident from Carey’s Enterprise Logs story, “Veil at Valcour.” There’s a Deep Space Nine quality to Carey’s Baltimore, specifically Fells Point; it’s a crossroads and a dockyard, where the future begins, filled with people who have their own stories and agendas. Finally, Boyle is cut very much from the same cloth as Carey’s interpretation of Kirk. He’s the best, he knows it, he has the best crew, he knows every inch of his ship and what it’s capable of. He has an easy rapport with his crew, especially his first officer, and he commands the loyalty of his crew because he’s earned it. Boyle and Kirk, especially the Kirk from Wagon Train to the Stars, would be kindred spirits. I liked Banners. It was, by and large, what I wanted from a Diane Carey novel about the War of 1812. I’ll shelve it with my Hornblowers and my Sharpes and my Bolithos. If Carey wrote another novel in this vein, perhaps about Oliver Hazard Perry and the Battle of Lake Erie, I would certainly be interested.